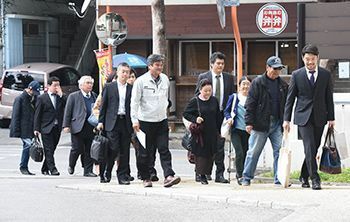 On January 29 at Higawa in Naha City, the plaintiff group visits the Naha district court to file its lawsuit. On January 29, 16 Nago residents living in the vicinity of the landfill area resorted to legal action at the Naha district court to seek cancellation of the state’s decision to suspend revocation of the landfill permit. Japan’s Minister of Land, Infrastructure, Transport, and Tourism (MLIT) suspended the revocation based on the Administrative Appeal Act. The plaintiffs’ aim is to prove the illegality of this method by the MLIT, by which it has made the prefectural government’s permit revocation ineffectual. Nago City Council Member Takuma Higashionna said at a press conference at the Okinawa Bar Association, “We have already suffered from the construction and the temporarily restricted areas. According to their complaint, the plaintiffs are planning to claim that the Minister of Land, Infrastructure, Transport, and Tourism who made the decision is not a neutral third party to this situation and cannot act as an examining agency. The plaintiffs believe that as a national institution the Okinawa Defense Bureau is not subject to the Administrative Appeal Act, which is meant to protect the rights and interests of Japanese citizens, and therefore the Act cannot be used in this way. One lawyer representing the plaintiffs, Peku Chun, said, “Both the Minister of Land, Infrastructure, Transport, and Tourism and the defense bureau are national engines. They seem to be in collusion to infringe on the rights of people.